To say the Philadelphia 76ers have been struggling lately is an understatement, but few franchises can match the overall player quality found in the history of the Syracuse Nationals and 76ers. Boasting some of the biggest names in NBA history, the 76ers have three titles and plenty of elite options for rookie collectors. Check out the top 76ers vintage and modern rookie cards of all-time in our detailed guide. In order to account for the changes in the hobby, the list is split between vintage and modern cards. The vintage list includes anything before 1980 and the modern list covers everything after 1980. The ranking for the vintage list is based largely on actual card value, but overall significance is taken into account when values are close. 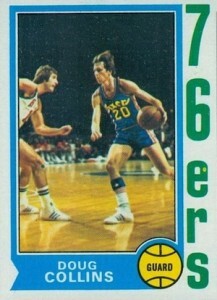 View the top modern Philadelphia 76ers rookie cards using the tab above. 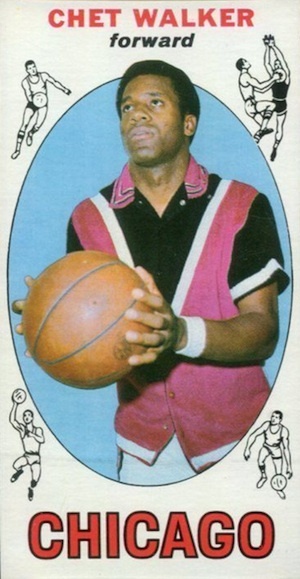 While he made his way around the ABA and NBA, Caldwell Jones is best remembered for his time with the 76ers during the late 1970s and early 1980s. 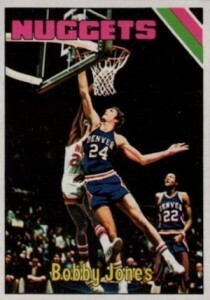 Strong on the boards and a top defender, the colorful rookie card for Caldwell Jones is found in 1974-75 Topps. A good player on some bad teams, Fred Carter was one of the only bright spots for Philadelphia in the mid-1970s, leaving just before Dr. J arrived. 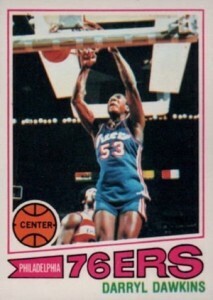 His 1970-71 Topps tall boy rookie card is a cheap 76ers collectible. The former coach for several NBA teams, including Philadelphia, Doug Collins honed his skills with a strong NBA career for the 76ers. A four-time All-Star, the budget rookie for Collins is part of 1974-75 Topps. 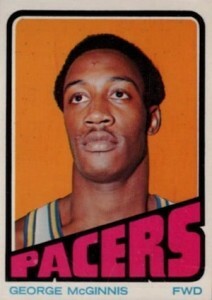 Despite spending a short time with the 76ers, George McGinnis was strong part of the team for three seasons and helped them reach the 1976-77 NBA Finals. 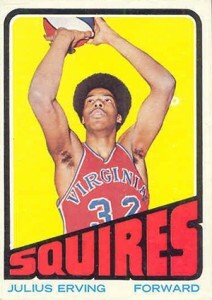 McGinnis was a two-time All-Star with the 76ers and collectors can find his rookie card in 1972-73 Topps. The man known by many as "Chocolate Thunder" started his NBA career with the 76ers and was one of the most dynamic dunkers in NBA history. 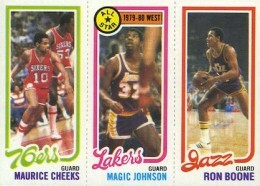 His 1977-78 Topps rookie is an appealing budget options for collectors of the 76ers. 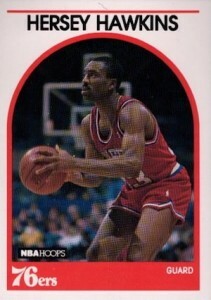 One of the greatest defenders in the history of the 76ers, Bobby Jones won a title with the team and added two NBA All-Star appearances and six All-Defensive First Team selections. His strong play led the 76ers to retire his number after he retired. His pink-themed rookie card is found in 1975-76 Topps. 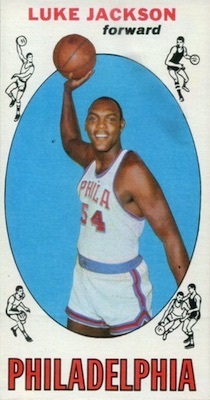 Lucious "Luke" Jackson spent his entire career with the 76ers, helping the team win their first NBA title and adding one All-Star appearance. While his rookie is part of 1969-70 Topps, one of the top vintage basketball releases, prices remain low. 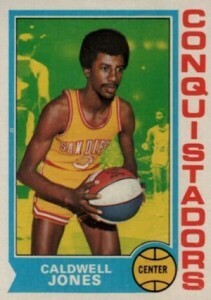 Also found in 1975-76 Topps, Moses Malone may be one of the most underrated players in league history. Although he played for seven teams during his NBA career, the Hall of Fame player was very productive during his four seasons in Philadelphia. 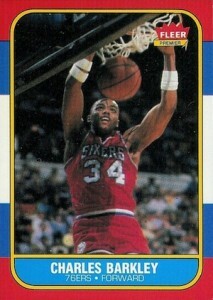 Malone was an All-Star each season, as well as the regular season MVP and Finals MVP for the Sixers in 1982-83. His 1975-76 is a top option among budget HOF cards. 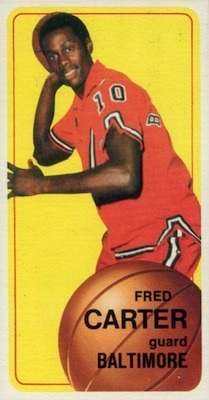 An important player for two franchises, Chet Walker began his career with the Nationals and 76ers and ended his career with the Chicago Bulls. 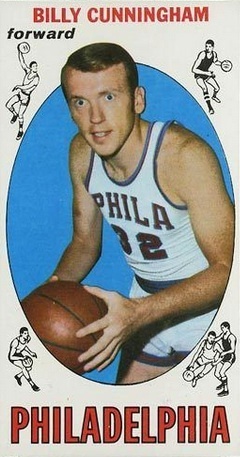 Walker was a three-time All-Star in Philadelphia and part of the 1966-67 title team. His 1969-70 Topps rookie is another budget Hall of Fame option. Nicknamed the "Kangaroo Kid," Billy Cunningham played the bulk of his career for the 76ers, with a short ABA stint sandwiched in the middle. 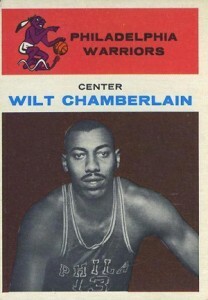 Cunningham was an important part of the 1966-67 title squad and was a four-time All-Star selection. His 1969-70 Topps rookie is a nice budget option for HOF collectors. 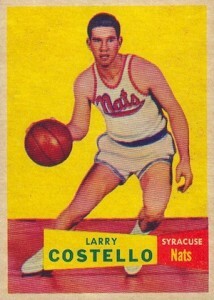 Part of the Syracuse Nationals and Philadelphia 76ers, Larry Costello was a six-time NBA All-Star with the franchise and one of the top point guards in team history. While the 1957-58 Topps set can get pricey, Costello's rookie is normally found for reasonable amounts. 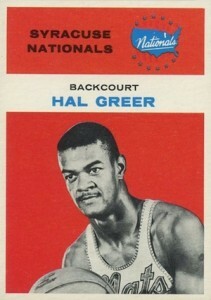 Hal Greer spent his entire career with the Nationals/76ers, adding ten All-Star appearances and one NBA title. The Hall of Fame guard is consider to be one of the best of his era and his rookie in 1961-62 Fleer marks the point where values begin to pick up. A three-time All-Star with the Syracuse Nationals, Paul Seymour's spot on the list is due to the value of his short-printed rookie card in 1957-58 Topps. 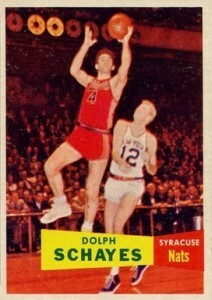 A 12-time All-Star with the Nationals and 76ers, Dolph Schayes played his entire Hall of Fame career with the franchise and led them to their first title. His rookie is also found in 1957-58 Topps. I wonder why they called him Red? 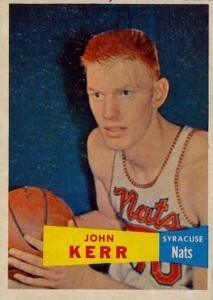 Johnny Kerr was a three-time All-Star and one-time NBA champion with the Nationals/76ers. 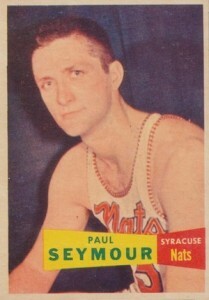 Like Paul Seymour, his rookie card values are boosted by the rarity in relation to other cards in the 1957-58 set. One of the greatest NBA players, Julius Erving is arguably the top player in team history. With one MVP, one title and 11 All-Star appearances, Erving is one of the most decorated Sixers of all-time. His 1972-73 Topps rookie is a collecting icon and the prices reflect that. View a full collecting guide here. Even with less than four seasons playing for the 76ers, Wilt Chamberlain put forth a memorable run with team. He was a three-time All-Star and regular season MVP with the Sixers and helped them win the 1966-67 title. Wilt Chamberlain's 1961-62 rookie is one of the most valuable vintage basketball rookies and high grades can reach five figures. View a full collecting guide here. While the vintage list is clearly the stronger of the two, Charles Barkley and Allen Iverson are among top players in league history and both fall into the modern category. Outside of those two names, there are still plenty of options for collectors. While they have not yet earned a place on the list, an influx of young talent, like Nerlens Noel, Joel Embiid and Michael Carter-Williams, might eventually push the 76ers back to the top of the NBA. Given the differences in the hobby from the 1980s until now, the overall ranking is based largely on overall player significance. Click on the listings or images to shop for singles on eBay. 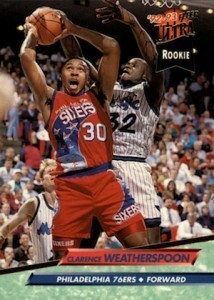 One of the top players on the team during the 1990s, Hersey Hawkins logged one All-Star appearance with the 76ers. 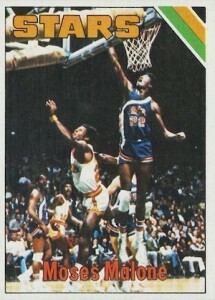 Rookie collectors have two choices for Hawkins with 1989-90 Fleer and Hoops, and both are cheap. A consistent scorer for multiple seasons in Philadelphia, Thaddeus Young was part of the three-team trade that sent Kevin Love to Cleveland and Young and Andrew Wiggins to Minnesota. He has quite a few rookies available and his Chronology card is one of the rarest. 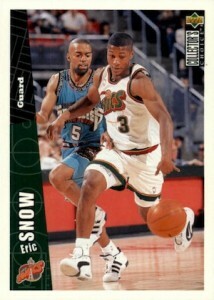 A popular point guard during the Allen Iverson era, Eric Snow's passing mindset and defensive ability made him a great complement to Iverson. With only one rookie card, Eric Snow collectors have just a Collector's Choice card to chase, but there was also a signed Autographics insert released during his rookie year. While his career with the 76ers ended just as he was making the transition to a higher level of play, Jrue Holiday was still a good point guard during his four-year stay in Philadelphia. Holiday was traded after his first All-Star season. There are plenty of 2009-10 rookie options for Jrue Holiday, but the clear favorite is his National Treasures card. View a detailed collecting guide here. Although Clarence Weatherspoon's career started off strong, the 76ers struggled as a team during his best years. Despite this, he is still remembered fondly by the fan base and was a consistent producer for the team until he was traded. 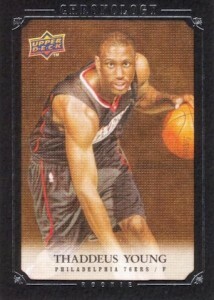 All seven of his 1992-93 rookie cards are inexpensive, but his Ultra is notable because he is shown battling Shaquille O'Neal, a fellow rookie. One of the top players for the 76ers since Allen Iverson, Andre Iguodala was an elite scoring option and a one-time All-Star. Although he helped the team reach several playoff appearances, Iguodala was eventually traded. 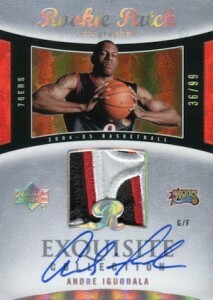 2004-05 Exquisite Collection is the most popular rookie card option for Andre Iguodala. 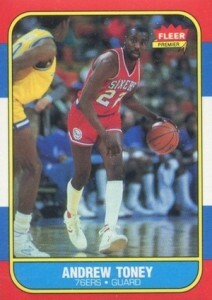 Very popular with fan base, Andrew Toney played his entire career in Philadelphia. The two-time All-Star also won a title with the Sixers, but was somewhat overshadowed by his Hall of Fame teammates. While his official rookie did not come until 1986-87 Fleer, there are several Star releases that pre-date the Fleer card. Part of the 76ers teams that also included Charles Barkley, Julius Erving and Moses Malone, Mo Cheeks was a somewhat unheralded player during his time in Philadelphia. Despite this, the four-time All-Star is a fan favorite and his number was retired by the team. 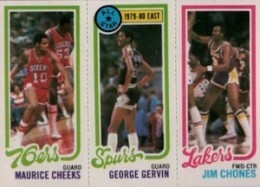 Cheeks has four cards in 1980-81 Topps, but the cards that pair him with Magic Johnson and George Gervin are his most popular rookie options. Although Charles Barkley only spent about half his career with the Sixers, he still managed to put forth some terrific numbers. The only thing the six-time All-Star was unable to do was bring a another title to Philadelphia. His 1986-87 Fleer rookie is very popular, but earlier Star cards carry weight in the hobby as well. View a detailed collecting guide here. The greatest Sixer of the modern era, Allen Iverson ultimately suffered the same fate as Charles Barkley and was unable to bring home a title. 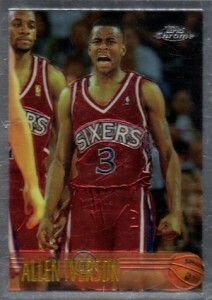 A seven-time All-Star with the 76ers and Hall of Fame lock, Allen Iverson remains popular with collectors. His 1996-97 Topps Chrome rookie checks in at the top spot. View a detailed collecting guide here.